I never knew Lai. My own political views are quite different from Lai’s. Lai was a socialist. I am a free market anarchist. But I do share one thing with Lai and my friend Ling-chi. I share their sworn hostility toward racism and racial inequality. 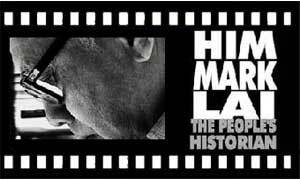 Him Mark Lai helped set the record straight about the history of ugly bigotry against ethnic Chinese in America. And for that he deserves the highest recognition. Him Mark Lai, an internationally renowned archivist and historian of Chinese America and a highly respected leader of the community, died peacefully on Thursday, May 21, after a long struggle with cancer and other complications. For his immense contributions to Chinese American history, Prof. L. Ling-chi Wang of Asian American Studies at UC Berkeley called him “the Dean of Chinese American history.” He was 84 years old. Him Mark Lai was born on November 1, 1925 in San Francisco’s Chinatown. Lai was the first in his family to begin life in America. His mother, Dong Hing Mui, was raised in Guangzhou while his father Maak Bing—from Chunghaa Village, Nam Hoi county—entered the United States under the paper name of Lai. But he passed his true ancestral roots to his five children by giving them each the middle name of Mark. Since his childhood in Chinatown, he was an avid reader and collector of books in both Chinese and English. Like many Chinatown children before World War II, he started schooling at both Commodore Stockton Elementary School and Nam Kue Chinese School. From there, he went to Francisco Junior High School and Galileo High School. He excelled in both public and Chinese schools. During his final year at Galileo High, he also won a citywide essay contest for which he was honored at a student body rally. Upon graduation from high school, he expressed his desire to go to college. However, his father urged him to go for a job in the city’s shipyards, pointing out that racism had prevented his own employer, a university graduate, from working in his profession. Him Mark refused and his irresistible desire was supported by his mother. Toward this end, he worked part time for 25 cents an hour at a sewing factory while attending first in the City College of San Francisco for two years. He completed his mechanical engineering degree at the University of California, Berkeley, in 1947. Between work and study, Him Mark found time to join the San Francisco chapter of the Chinese League for Peace and Democracy, an organization opposed to American interference in China’s Civil War, 1945-1949. In late 1949, he started volunteering for the Chung Sai Yat Po, the first daily paper to support the new People’s Republic of China, and became also a member of organizations active in persuading students to return to China to serve the new government. He also joined the Chinese American Democratic Youth League, more familiarly known as Mun Ching, where he met Laura Jung, a young new immigrant, whom he eventually married in 1953. Laura became his life-time companion and steadfast supporter and collaborator in his work on Chinese American history until he died. Since he never learned how to drive, his countless research trips criss-crossing the U.S. could not have been accomplished without the ever-present love, care, and devotion of Laura. With his hope of returning to China thwarted, he settled for a job in Bechtel Corporation as a mechanical engineer. The profession provided him both security and income and allowed him to pursue his real passion: the study of Chinese history and culture. During the McCarthy era in 1950s, introducing the Chinese community to the songs, music, folk dances, and vernacular dramas of the New China through Mun Ching—now renamed the Chinese American Youth Club—proved immensely satisfying despite the cost of constant FBI surveillance and intimidation. In the process, he also gained mastery of both spoken and written Chinese, skills turned out to be most useful for his later interest in doing research in Chinese American history. When Mun Ching lost its clubroom in 1959 and was forced to close, Lai felt intellectually restless. The following year, he enrolled in a course, “The Oriental in North America,” a relatively new course taught by Stanford Lyman at the University of California Extension in San Francisco, which exposed him for the first time to the histories of the Chinese, Japanese, and Filipinos in America. He subsequently read a half dozen or so titles on Chinese in America published in the early 1960s and joined the Chinese Historical Society of America soon after its founding in 1963. These events, together with contemporaneous changes in the status of minorities spurred by the Civil Rights movement, led Lai towards developing a Chinese American identity and history. In 1967, he accepted an invitation by the East/West, the Chinese American Weekly, a Chinese bilingual weekly published and edited by Gordon Lew, to write a series of articles on Chinese American history. This marked the beginning of his interest and devotion to reclaiming Chinese/American experience—a fortuitous confluence of his passion for history and his deep commitment to his bicultural heritage and democratic principles. His most significant contributions to Chinese American history fall in three broad categories: research and publications; archival collections; and nurturing and mentoring of young Chinese American historians. In all, he published and edited ten books and more than one hundred articles in English and Chinese on all aspects of Chinese American life. His East/West articles—revised and annotated—became the basis for the classic A History of the Chinese in California, A Syllabus, coedited with Thomas W. Chinn and Philip P. Choy, as well as for the first Chinese American history course in the United States, which Lai team taught with Choy at San Francisco State College in Fall 1969. Their joint teaching resulted in another classic Outlines: History of the Chinese in America. Lai’s first scholarly essay, “A Historical Survey of Organizations of the Left Among the Chinese in America,” published in the Fall 1972 issue of the Bulletin of Concerned Asian Scholars—together with subsequent revisions—remains a standard reference. So do Island: Poetry and History of Chinese Immigrants on Angel Island 1910-1940, co-authored/translated with Genny Lim and Judy Yung; Lai’s “Chinese on the Continental U.S.” in the Harvard Encyclopedia of American Ethnic Groups; his From Overseas Chinese to Chinese American: a History of the Development of Chinese during the Twentieth Century (in Chinese) and articles in the Encyclopedia of Chinese Overseas and Huaquiao Huaren baike quanshu [Encyclopedia of Chinese and people of Chinese descent overseas]. Under his guidance and editorial leadership, no less then ? volumes of monographs, entitled, Chinese America: History & Perspectives, have been published. Each monograph contained original historical studies on subjects in Chinese American history by historians, young and old. Among his most important books is Becoming Chinese Americans: A History of Communities and Institutions, published in 2004. Besides being a historian and archivist, Him Mark Lai was a generous and effective teacher, always ready to share his wealth of knowledge and collection with anyone interested into doing research on Chinese American history. He taught occasional courses in Chinese American history in the Asian American Studies Programs at San Francisco State University and the University of California, Berkeley. He provided guidance to hundreds for graduate students and scholars throughout the U.S. and across the globe. It would not be an exaggeration to say that virtually ever dissertation and book on the subject in the past thirty years is indebted to his research, collection materials, or guidance. Beyond his contributions to Chinese American history mentioned above, Him Mark Lai also maintained his cultural and political commitment to the Chinese American community. For thirteen years, he coordinated a group that produced Hon Sing, a weekly radio program of news commentary, community announcements, and Chinese music under the auspices of the Chinese for Affirmative Action; and he served multiple terms on the boards of many organizations—such as the Chinese Culture Foundation and the Chinese Historical Society of America—often assuming the responsibilities of president. He also encouraged and brought to light new research by others through his decades of work on the editorial committees of Amerasia Journal and other publications. Not widely known to the public is his lifelong quiet, but consistent support for racial equality and justice for Chinese Americans. He always supported the progressive, and quite often, unpopular, but just causes in the Chinese American community, even though he rarely played a visible role in these struggles. Finally, Him Mark Lai was a tireless promoter of better understanding and friendly relation between the U.S. and China. He understood the importance of this relationship to the interests and welfare of Chinese Americans and he consistently supported events and projects promoting better relations between the two countries. In conclusion, Him Mark Lai will long be remembered as the historian who rescued Chinese American history from oblivion and restored Chinese American experience as an integral part of not just U.S. history but the history of modern China. A memorial service and celebration of Him Mark Lai’s life will be held at the Chinese Culture Center at 750 Kearny Street in San Francisco’s Chinatown on Saturday, June 20 at 2:30 p.m., followed by dinner at Gold Mountain Restaurant, 644 Broadway, at 5 p.m. In lieu of flowers, please send donations to the “Him Mark Lai Digital Archive Project” of the Chinese Historical Society of America (CHSA), the “Him Mark Lai Heritage Fund” of the Chinese Culture Foundation (CCF), Chinese for Affirmative Action (CAA), or the charity of one’s choice.